'Half of Delhi residents have no water' Jump to media player The BBC's Justin Rowlatt reports on how Delhi residents are coping with a shortage of water, after protesters sabotaged a canal supplying the city. 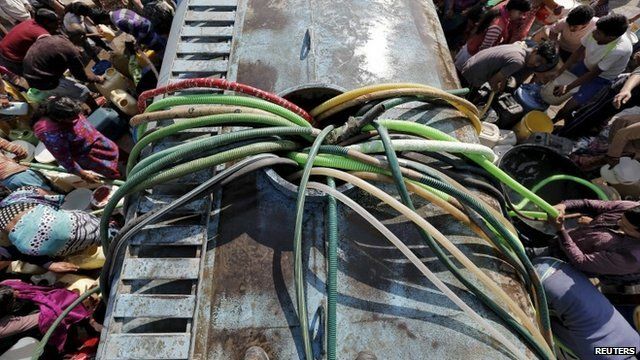 India caste unrest 'encircles Delhi' Jump to media player The Indian capital, Delhi, is facing severe water shortages after protesters demanding better job opportunities for their caste sabotage a canal supplying the city. Old cars banned over Delhi's dirty air Jump to media player Vehicles more than 15 years old are being ordered off the streets in the Indian capital New Delhi in an attempt to cut pollution. Cycling cities: Delhi and Amsterdam Jump to media player The BBC looks at what it is like to be a cyclist in Amsterdam and Delhi. More than 10 million people in India's capital, Delhi, are without water after protesters sabotaged a canal supplying the city. Members of the Jat community, who are demanding more government jobs, seized the city's main water source on Friday. The BBC's Justin Rowlatt reports from Delhi.